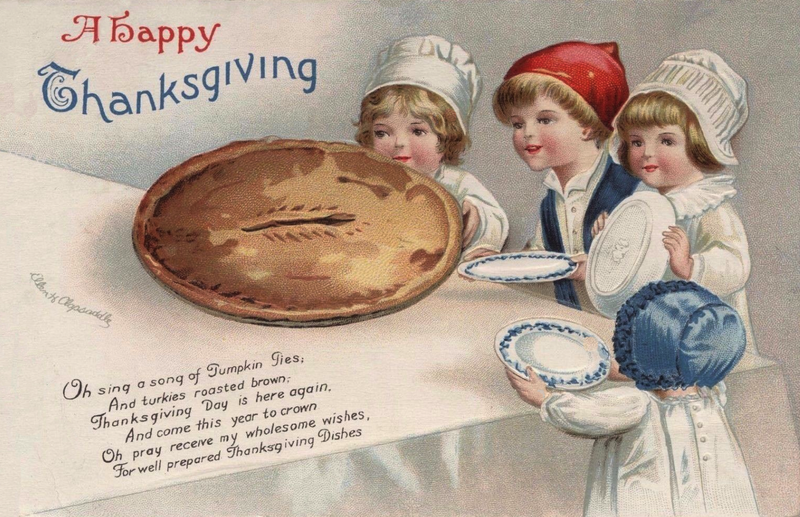 Four sweet children and one giant pie with a little ode to well prepared Thanksgiving Dishes. Ellen H. Clapsaddle (1865-1934) was one of the most prolific American artists during the Golden Age of Postcards. Many of her holiday illustrations included charming red-cheeked children. She worked with the International Art Publication Co from New York who had most of their cards printed in Germany. At the time, the Germans were the best printers in the business. It’s thought that there were around 1/2 billion cards printed with Clapsaddle’s designs. Three children can’t wait to have their serving of pumpkin pie. A rosy-cheeked child, in a baker’s hat, is presenting the huge pie to the other children. Each child stands and the table with its white cloth holding their blue and white china plates. The girls are wearing white dresses and the boy has a white shirt, blue vest and bright red cap.